Most car shoppers have heard of the Auto Trader website. It is a great place to research vehicles, get tips on purchasing a car, and get help with calculating monthly car payments. Free Registration - Becoming a member of Auto Trader is easy. It only requires an email address and password. Once you're part of My Auto Trader Online, you'll have access to newsletters, vehicle information updates, and a personalized page that saves your searches and manages your alerts. 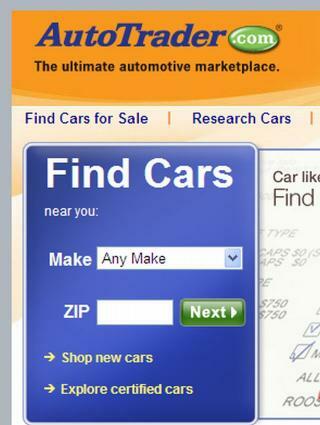 Find Cars for Sale - Click on this tab, enter your zip code and start searching. Choose the option to browse all cars, new cars, used cars, or certified pre-owned cars. Narrow your search by choosing a make, model, body style, year, and price range. You can calculate a monthly car payment here as well. If a used car is what you're looking for, print out the handy Buying a Used Car Checklist! Research Cars - Along with the pre-loaded most popular car comparisons you can do your own research. Search by price range, manufacturer, or specific model. Unsure about what crossovers and hybrids are? Auto Trader gives you a full explanation along with tips on deciding what car is right for your budget and lifestyle. You'll also find dealers near you, money saving tips, and a list of upcoming auto shows. Sell Your Car - Just enter your zip code to get started. Auto Trader Online helps you compare current selling prices similar to your car, offers selling tips, has a what's my car worth feature, and an ad checklist to ensure your listing is a hit. Auto Trader partners with many other online used car sites and your listing will appear free on all of those partner websites. You can even contact a live support person 24/7 to aid you in listing your car. Find Local Dealers - This feature is a simple, easy way to find both new and used car dealers near you. Loans - Need a car loan? Auto Trader offers ways to help you find one. You can research either conventional auto loans or auto refinancing companies. Keep in mind that this page will redirect you to a form where you complete personal credit information. While the site has a secure server and your information is safe, if you don't want to be contacted by lenders then don't complete this online form. One nice feature is that Auto Trader partners with Lending Tree to find loan resources for you. By utilizing Lending Tree, your credit report will only be run once. Insurance - With every car you buy comes the necessity for car insurance. Auto Trader partners with GEICO insurance. It does offer an easy three-step process to get a quote on a car insurance policy. If you don't want to be contacted by phone or email, make sure you check the appropriate boxes when you register. If you don't want to have your credit report run or have loan companies call you, skip the Loan tool. Expert Reviews - Auto Trader gathers reviews from many different sources, like Cars.com and online magazines. Read these reviews to get a better understanding of each car you research. If you already have a preferred insurance carrier, you may want to skip the Insurance tool. However, obtaining a free quote is always a good idea. Auto Trader is a great place to research used cars. If you're still unsure what type you want after reading the reviews, seek out other resources like Edmunds. With Auto Trader Online you can browse for-sale car listings, research cars, and even sell your own car. This online car website can be your one-stop car assistance site for finding the right vehicle at the right price or it can help to sell your own vehicle.